1. Preheat the oven to 200°C, gas mark 6. Remove 2-3cm of stalk from the bottom of each cabbage leaf. Cook in boiling water for 5 minutes until just tender, drain well and place on a large chopping board. 2. Meanwhile, microwave the wheatberry, lentil and vegetable mix according to the pack instructions, and divide between the cabbage leaves. Roll up each leaf like a parcel and place in an ovenproof dish, seam side down. 3. 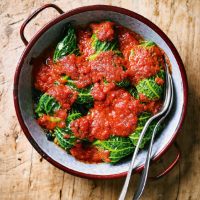 Heat the tomato and basil sauce in a small saucepan for 1 minute, and pour over the cabbage. Bake for 10 minutes.